My local Farmer's Market had a surplus of butternut squash at the end of the season. 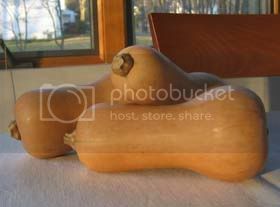 I'm not especially fond of butternut squash, but I like to support this local farm. So when I heard they were giving them away to avoid trashing them, I came home with a bagful. One reason I don't like these squash is their difficulty in preparation. They are hard. It's hard to pare and dice the hard, raw flesh. The resulting cooked product usually ended up ... hard. At least that was my memory of them. That memory is quite a few years old though, and it was formulated at a time when dinner at the end of a long day was corn chips and salsa. Paring, chopping, and stewing hard squash was in a league with changing the oil in my car. I'd do it if I had to, but paying someone else to do it was infinitely more welcome. A bagful of butternuts and a daunting memory. What's a woman to do? 1 Wash exterior with plain water. 2 Preheat oven to 320°F. 3 Wrap squash individually in aluminum foil. 4 Bake for 1.5 hours. Note: Three small squash softened nicely in 1.5 hours. If your squash are large or you're roasting several at one time plan for 2 hours. 5 Remove from oven, leaving the aluminum foil intact. Allow to cool for about 2 hours. 6 When cool, unwrap. Slice down the middle lengthwise. Scoop out and discard seeds. Cut the soft flesh into 2-inch sections. Pare and dice sections. The squash may be added to soups, stews, casseroles, or refrigerated for future use. I pureed the diced squash for use in a loaf. Loaf is a term used to describe any shaped mass of food, as in veal loaf or the more generic meat loaf, although it is usually reserved for items of bread. It has evolved to include sweetened doughs with a less elastic texture and a smaller crumb than bread, e.g. cake. The loaves (or squares) you see on this site cannot rightfully be called bread, nor are they cake. They were developed to make use of more healthful ingredients, to lessen the gratuitous use of nutrient-poor fats and sweeteners, and to maintain an attraction to the Fanatic's Resident Eater that would preclude him visiting vending machines for Tastykakes©.